Arriving home from Edinburgh I received a package! It was a great pick me up from having travelling back from Edinburgh to Dublin then to Limerick, good wake up call. 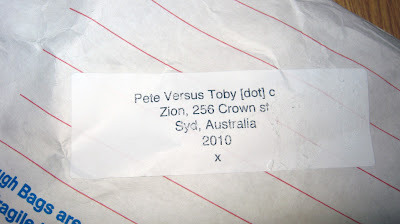 Anywho I'm a big fan of Pete Versus Toby an Aussie screenprinting brand who have really fun designed t-shirts, singlets and the like. My first purchase was at a flea market and my friend haggled this t-shirt for $10, a steal. And from there I've slowly built my collection, purchasing the rest from the online store itself (linkage below). This time I opted for a Singlet, featuring Kate Moss (and a lot of her). 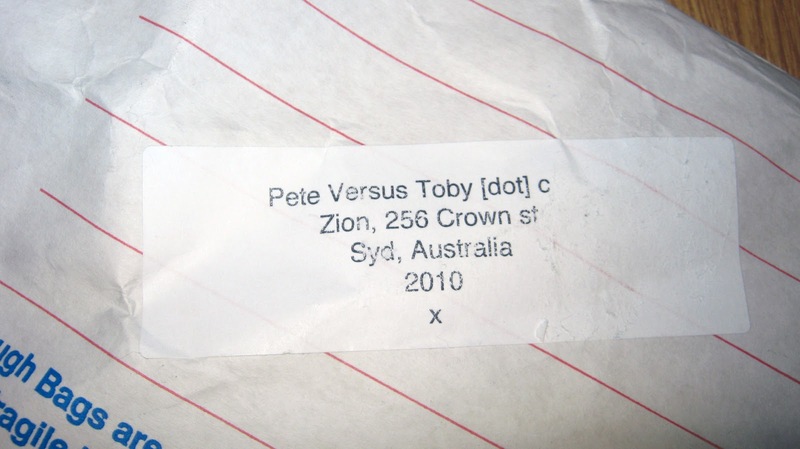 It also came with a free tote bag and a CD which I can't wait to see what's in it... tho I'll have to wait to find a CD drive... More wishlist love love love!